Earlier this week I was hiding out in the house whining about the unfavorable weather when Erin Shepley sent a message. “It’s gorgeous out there!” Naturally I pulled back the door quilts and had a look for myself. Doggone. The sun had come out. Miss Sadie, as is proper, led the way. The ice shelf meandered off to the south. An ice dragon guarded the northern path. To the west distant ice mountains beckoned. This is as far as I was willing to go. It may not look like a very big cliff, but if I had slid down it I would have had a bad time climbing back. I would have had to walk all the way to Northport to holler for help, and then I would have spent the rest of my life living it down. The Cowboy was put in charge of my gloves while I took pictures. He said he would have run for help if I’d fallen down the cliff but I suspect he would have gotten distracted along the way. Wow!!! Spectacular… wasn’t it? I hope you enjoyed the walk and view as much as we did. It is such a different feel out there. I almost called to see if you were home, but saw that you answered your other blogs, therefore, I knew you didn’t fall over the cliff. I was ready to mount a rescue mission if needed. 🙂 Thanks for sharing our winter bay with your readers. We are truly surrounded by beauty in all shapes, sizes, colors, and temperatures. It was a very good day. I’m glad you got me to open the door quilts. BIG water never disappoints when it comes to a good view. No matter time of year. 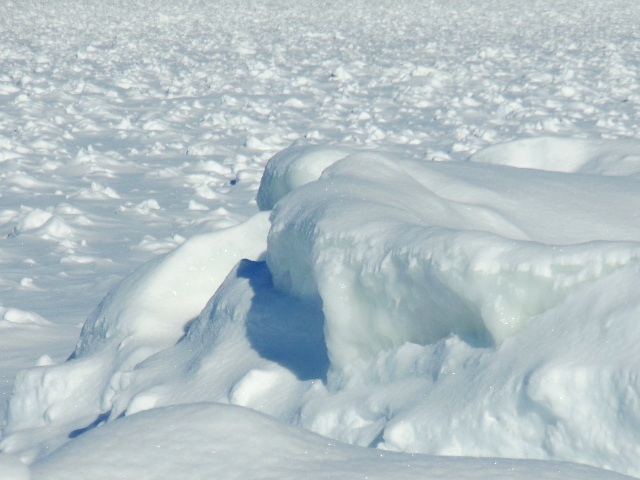 I’m looking forward to some sunny blue sparkly open water choppy ice views very, very soon…. Mick Ambler and I were talking about that today. 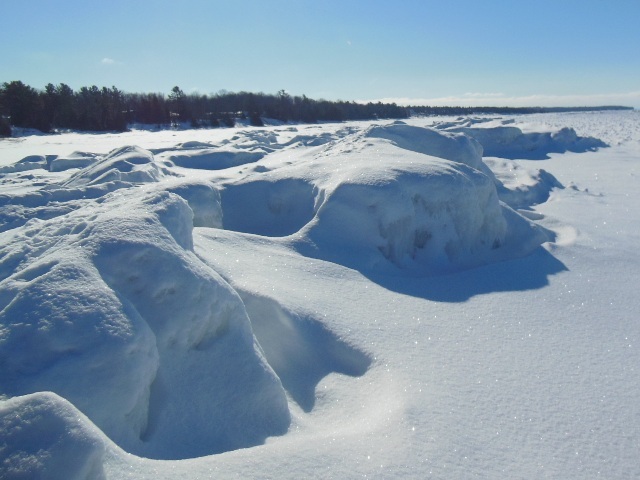 We are pretty sure that out in the middle of Grand Traverse Bay there is still plenty of very cold, very deep, very choppy open water. If we got up high enough we could see it. So glad he didn’t scamper to the edge of that cliff. Smart doggie. It is beautiful, though. So the Cowboy has you fooled too, eh? He’s gifted that way. Oh my, it looks like you live on a frozen tundra. Just next to one. Twelve miles of it. Gorgeous, Gerry! (How long did it take me to remember how to spell ‘gorgeous’? Did I get it right?) My favorite is the snow-covered peaks with the bright blue sky. I’d love to see you in Northport but am glad you didn’t have to walk across the frozen bay! My favorite too. 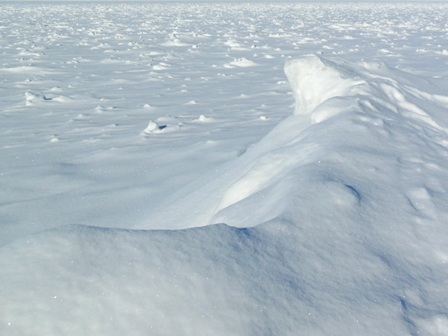 It would be an odd experience, wouldn’t it – walking across the Bay on the ice, able to see the destination . . . 12 miles is a long way across ice. 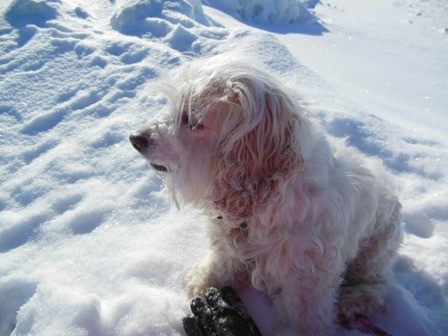 The Cowboy would probably amuse himself chewing on your gloves while you scrambled back up the snow cliff. These photos are lovely Gerry. Did you have to wear sun glasses coz it was so bright ? The trouble with living in a place where it’s often cloudy is that I never think about sun glasses. I just squint. Sad. Absolutely delightful in every way. Very wise to stop when you did. Even a stopped clock . 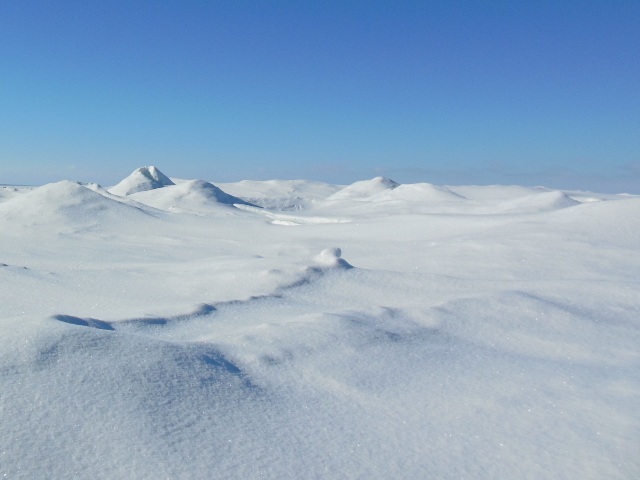 . .
Beautiful blue skies against the white snow — which I’ll bet you’re glad to see. Lake ice with drifted snow on. That’s something we don’t have around here — especially the large lake bit. We did get some moisture Sunday, and may get more today (snow flakes on the weather widget) with a predicted high of 21 F/-6.1 C (this is Texas, remember?) Don’t know if we made it, it’s 16F/-8.8C now. I include our local temps as I thought you could use a laugh. I would laugh but I have nothing but sympathy just now. It’s warmed up here so that we’re wandering around in the same temperature range. The real difference is that when winter is over, we’ll have plenty of water. Theoretically anyway. Mama Nature has her little ways. I’m not sure what I’m looking at in those first couple of pics – well, others, too. Are those chunks of ice that have been pushed toward shore and compressed, and then covered with snow? That fourth photo, the view of the “mountains”, is splendid. It makes me wish I was there, to walk a way toward the horizon. But not very far. I would think vertigo or some sort of disorientation could set in pretty easily, especially for someone not used to such a landscape. Amazing how like the desert it is in that respect, or the ocean. It helps to explain the sun and stars as navigation aids. Big lakes freeze from the beaches out (with other variations having to do with currents and wave action). Based on my observations (taken for what they’re worth) once some ice has developed along the shoreline there are at least two ways that ice mountains develop. One way is that waves break off pieces and pile them into heaps on the shore. Another is that waves pushing under the ice spurt up through a hole and splash onto the surface. Think of it as a very cold volcano. The spurting liquid freezes and makes a cone of ice. More snow, more splooshing waves, more freezing – and you can get some pretty impressive ice mountains, with ice caves inside them. I’ll rummage around for some other posts that show the process more clearly. Very “Scott of the Antarctic” imagery. Though I suppose Sadie and the Cowboy would never agree to pulling a sled. 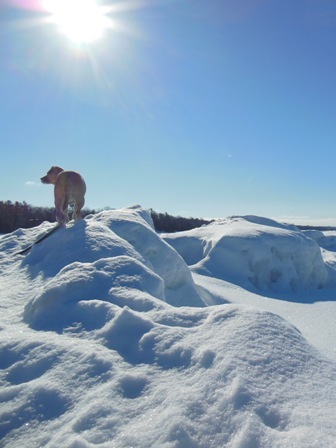 Miss Sadie the mountain climber, The Cowboy the gloves keeper, in the West snow dunes, all well worth seeing and enjoying. You live in a country full of beautiful natural surprises. Ooh! You make our little expedition sound like a Tolkienesque adventure. The Cowboy is very taken with his new title, Keeper of the Gloves.